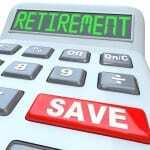 When can I retire financially free? How much money do you need to accumulate before you can retire and be financially independent? Find out using this simple calculator. so that I can live another 20 years spending $173,387 a year. 1. The formula to calculate your Annual Expenditure after retirement is: (Your Current Annual Expenditure x 80%) x (1 + Inflation Rate in %)ˆYears to Retirement. 2. Most financial advisors agree that after you retire your annual expenditure will generally be 20% lower. Hence the amount needed after retirement is calculated based on 80% of your current annual expenditure.